Effects: strong antiseptic, anti-inflammatory, antifungal, antiviral and bactericidal effect; enhancing the mental activity, calming, immune-stimulatory, insecticide, calming down itching and edemas. 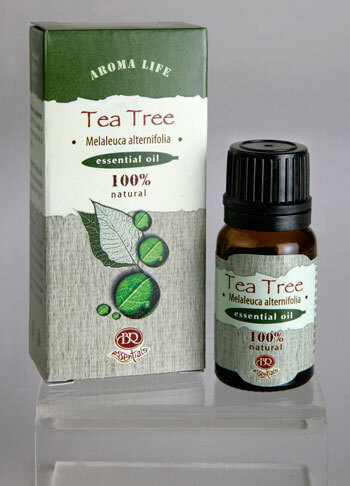 Benefits: The Tea tree essential oil is considered as the most efficient natural bactericide remedy. It contains more than 90 antibacterial compounds and has a strongly expressed antiseptic effect. It is called also “intelligent oil” due to its capability to destroy the pathogenic microorganisms without any damage on the favorable bacterial flora of the skin. It has strongly expressed anti-inflammatory properties, facilitates the vast healing of wounds, burns and dermatitis, but without any skin irritations and allergies. Efficiently hydrates the skin and normalizes the functions of sebaceous glands. It helps removing the plaque from teeth and tongue, eliminates mouth odors and gums inflammations. In steam inhalations it prevents cold and flu developing, and if they manifest – it aids recovery. When diffused in a burner it helps to prevent the spread of infection. Stimulates hair growth, manifests anti-dandruff effect. It helps to relax, to calm down the anxiety and nervous tension, improves the workability and stimulates the concentration. Blends well with most spices and herbs, lavender, pine and eucalyptus essential oils. Attention: Contraindicated for epileptics, hipotonic patients and children!